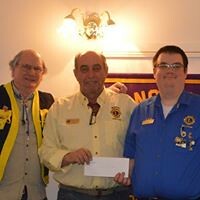 Over the past number of years, the Westport Lions Club benefitted greatly from the enthusiasm and expertise of one of its regular members, Lion Don Baker who served in many positions and a participant in almost every project the club was involved in. 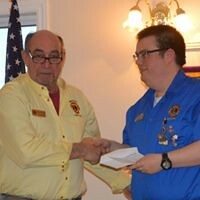 He was inducted as president of the Westport Lions Club for 2014-15 at their recent induction meeting. A local boy he often visited his ancestral family at the home that is now owned by Scott Blair, and he returned to Lions work as a club member, working from his home in the area of Cty. Rd. 10 and sharing his talents and energy before moving to his present home on Cty. Rd. 42. outside Westport. He has established the metal recycling project on his property before it was moved to the former trailer park adjacent to the club property on Cty. Rd. 36 and has been most successful. Lion Jim McGlade conducted the installation at the recent club meeting. Also at that meeting, Past President John Rempel who presented Frank Huth with the Lion of the Year Award. Rempel thanked everyone for their support over the past year in the many projects and community activities of 2014. The Board of Directors will be in charge of Club activities during the summer. 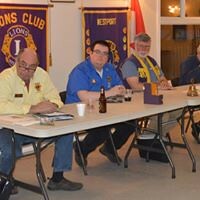 The slate of officers for 2014-15 are: Past President, Lion John Rempel; President, Don Baker; Lion Tamer, Dave Blair, Tail Twister, John Rempel; Directors Gary Warriner and Frank Huth, first Vice President, Wayne Bent; second Vice President, Pat McGinnis; third Vice President, Rick Warriner; Treasurers, Jim Scala and Bill Garland; Secretary, Bob Reddick and Mike McIntyre. 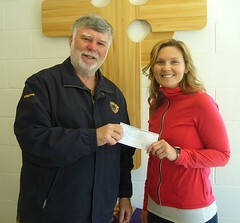 Lion Bob Weir was thanked and received a gift for his work with the Lions Mobility Van.